Today I’m reprising a talk I did last year with Professor Elizabeth Robison’s Sociology class. We’ll be discussing a brief history of agriculture and food production in the U.S. Key points are how the capital requirements, political dynamics, and technology developments have combined to make food production anything but the success story free market advocates often claim. One thing I’m adding this year is some insights into how a commons works and how the commons and coops might rescue us from Big Food and Big Ag. Link to download slides in Powerpoint format. Posting links to two incredibly useful resources for students and people doing research on incomes, income distribution, and income inequality. These resources are useful for both historical data and visualizations as well as cross-country comparisons. The first is the World Top Incomes Database from the Paris School of Economics. Many thanks to the Paris School and researchers Facundo Alvaredo, Tony Atkinson, Thomas Piketty and Emmanuel Saez. It’s a a tremendous resource. The second is a tremendous resource also. It’s Our World In Data. It’s a work in progress project by Max Roser, but it’s already jam packed with great data and visualizations on incomes, health, war and violence, poverty, and food and hunger. And best of all, it’s all CC-BY-SA licensed. I love it when collaboration and the commons come together to support learning. So Who Pays For the Government and How? I’ve always found putting things in historical perspective and looking at the long-term trend of things usually illuminates a lot of policy discussions. It’s easier to see “what’s really happening” if you look at the long-term trend. 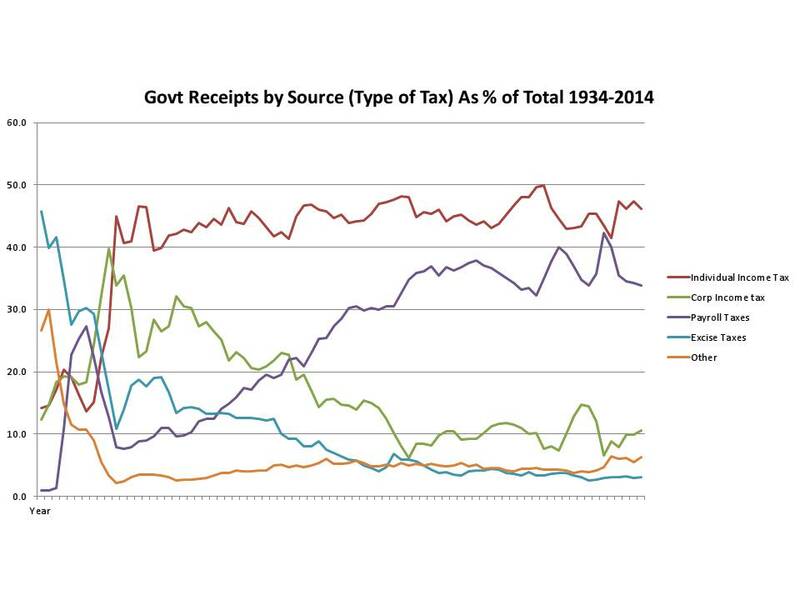 Taxes, tax rates, and the government budget are often hot topics of policy debate. So is the future of the intergenerational social insurance programs such as Social Security and Medicare (also here). As Paul Krugman has often mentioned, the best way to think of the U.S. federal government budget is to think of the government as “an insurance company with an army”. But who pays for this insurance company (Social Security, Medicare, Medicaid) and it’s accompanying army? The distinct trend of the last few decades is that individuals are being asked to shoulder more and more of the burden and that corporations are carrying a less-and-less share. In fact, as this graph shows, the corporations are nearing becoming insignificant in their contribution to the general welfare and maintenance of our government. The data for this graph is from Office of Management and Budget in this file. Political debates about taxes and tax rates in the U.S. often focus on the rich and claims about the incentive effects of different tax rates. Rarely mentioned these days are the poor. Indeed, the Republican demands in the last few years that tax rates should be cut for the high-income rich are primarily about claims of incentive effects. And, no, high-income rich isn’t redundant; it’s precise. There are at least two types of “rich”: High-income rich, which pay income taxes, and the high-asset, low income rich which pay much less. (I suppose there’s another type, the spiritually-rich, but that’s the domain of some other blog.) The claim is made that if tax rates are raised or raised too high, then that provides a disincentive to work and the rich will not work as much. It is often asserted that this is simple micro-economics–that people respond to incentives–and should be obvious. There’s a problem with the claim, though. Actually there are two problems. First, there’s very little empirical evidence of higher tax rates on the highest end, the rich, actually reducing their efforts to earn income. Indeed, numerous studies (I don’t have time at the moment to look for citations) have found in “natural experiments” that the rich really don’t respond to higher tax rates by working less and earning less. Several studies have found that in situations where a large metropolis straddles two or more states, such as NYC, and different neighboring states changed their tax rates on the rich, the rich did not in fact do what they threatened or what would appear “rational”: move to the lower tax state in the same metro area. There’s also substantial longitudinal evidence in the U.S. and other countries that shows when tax rates on the rich were a lot higher, such as in the 60’s and 70’s, effort and incomes were no less than in more recent times. The other problem is the whole idea that the “rational” response to higher tax rates is to reduce one’s effort and income actually doesn’t hold microeconomic water. It’s actually irrational to respond that way unless the marginal tax rate is truly so high that it approaches or exceeds 100%. The average tax rate, the percents you normally hear on TV, isn’t what affects incentives. Instead, it’s the marginal rate, or how much an extra dollar earned is taxed, that changes how we behave. Even then, a raising a marginal tax rate might reduce the incentive or attractiveness of additional effort and gross income, but won’t become a true dis-incentive until it becomes very, very high. An example: Let’s suppose someone makes $1,000,000 a year and is taxed $400,000. Such a person is said to pay a 40% average tax rate or effective tax rate. But averages and effective rates tell us nothing about incentives. Incentives deal with changes in behavior at the margins – the incremental changes. If micro is clear about one thing and has been since the 1870’s, it’s that decisions and changes in behavior depend on changes in marginal costs and marginal benefits. What matters is the taxes on the marginal, the incremental, change in income. What matters is the marginal tax rate. The only reliable way to figure the marginal tax rate is to compare two different amounts of income, preferably with only a small difference between them, the taxes paid and the after-tax-income that results. What people work for is to get after-tax, spendable income. So let’s continue the example. Suppose the existing tax code, with all of its exemptions, deductions, rates, credits, etc, says that $1,000,000 income pays $400,000, but that $1,010,000 income pays $405,000 in taxes, then we have an increase in income of $10,000 of which $5,000 is used to pay the additional taxes. After-tax income rises from $600,000 to $605,000, leaving a net increase in after-tax income of $5,000. This means we have a marginal tax rate of 50%. There be a disincentive effect only if opportunity cost (usually leisure) of the additional time/effort needed to generate the higher income is judged to be greater than the $5,000 increase in after-tax income. Empirical evidence indicates that is not likely. On the other hand, if the marginal tax rate were 100%, it would mean that $1,010,000 in income requires $410,000 in taxes. At a 100% marginal tax rate none of the additional effort results in more after-tax spendable income, so obviously it doesn’t make sense to exert the extra effort. So what are the marginal tax rates for the highest brackets in the U.S.? Even if all income comes from wages, the highest marginal rate is now around 38%. Even if you include state or city income taxes, the marginal rates faced by the rich aren’t greater than 50% even in the most onerous tax-happy states. For the really rich, most income comes from capital gains and not wages. Capital gains have a much lower marginal tax rate of close to 23-24% (including the 2013 Medicare tax on capital gains). Evidence is pretty clear that such marginal rates do not provide a disincentive to additional work. Readers were incredulous, asking how it could be that in a nation with a top federal income tax rate of 39.6% on individuals making more than $400,000 a year, anyone could face a 90% rate. It is true. Marginal tax rates, especially for those below the top rate brackets, are chaotic, confusing, and all over the map. As a result, some of the working poor face extremely high rates on their next dollar earned. Tax scholars and economists have long known this. Dan Shaviro of NYU published a study in 1999 showing marginal tax rates above 100% on the working poor; specifically, he illustrated that a single parent earning $10,000 would lose over $2,500, after taxes, by earning another $15,000, pushing her income to $25,000. Obviously, this is a policy failure. We want to support the working poor, but we want them to be able to increase their incomes, join the middle class, and leave dependency behind. Yet the way most welfare and aid to working poor programs are structured, a working poor person can find themselves in a situation where working additional hours or getting a modest raise in wage will actually result in less after-tax spendable money. The problem is even worse, as Professor McCaffery points out. The tax code exerts a genuine disincentive to getting married or to staying married if you are among the working poor. Yet, we know that stable marriages and two-income households are often the key to escaping poverty for both the present and next generations . It’s appropriate to talk about the incentive effects of tax rates. Incentive effects should be part of the thinking when writing the tax code, just as reasons for government revenue should be a part. But when we talk about incentive effects of tax rates, we must focus on the marginal rates and we really should be talking about the poor. Not the rich. One of the core lessons that I try to get across in my introductory Comparative Economic Systems classes is that economic systems are complex. Reality is much more complex than either simple theory or ideology. Countries simply cannot be easily categorized with simple labels such as capitalist, socialist, or communist. Those labels usually obscure more than they illuminate. The labels are the work of ideologues and theorists. Pure capitalism or socialism or communism exists only in the mathematical axioms of textbooks, the novels of Ayn Rand, or the writings of some political power grabber. Real economic systems are the creatures of politics, history, the available resources, culture, religion, and some economic theory. Another lesson I try to impart is that while we might all want to improve economic conditions, how to do that effectively is also complex. There are no silver bullets or universal magic solutions. There are costs and benefits to any proposed policy or practice. The key to progress is evaluating those costs and benefits wisely and making conscious decisions. Last weekend I heard a story on the This American Life radio. It was called Mr. Daisey Goes to the Apple Factory. It’s about a man who goes to visit the workers at Foxconn, the company that manufacturers Apple products in China. It’s a long story, but it’s gripping and powerful. It struck me that it also powerfully illustrates the two lessons I’m trying to teach in class: economic systems aren’t that simple and making things better isn’t always obvious.